From Cuba to Penzance ... cannas everywhere! 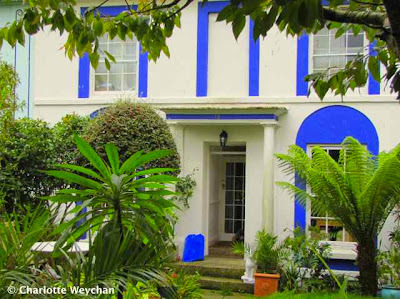 From Cuba to Penzance ... all in a week! 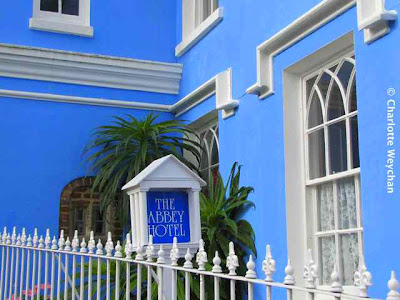 I'm here in Cornwall on family business, staying in the glorious Abbey Hotel - started by famous 60s super model, Jean Shrimpton - which overlooks Marazion and St Michael's Mount, and although the weather's not as good as Havana, the gardens here are amazing ... with many tropical plants similar to those we saw in Cuba. The Abbey Hotel has its own tiny charming garden (below) which still has many plants in bloom, although I'm told that it's at its peak in spring, when the tulips are out. Penzance is lucky in that it enjoys a sub-tropical climate and one of the striking features of the town is the huge number of palms you see everywhere ... and cannas. 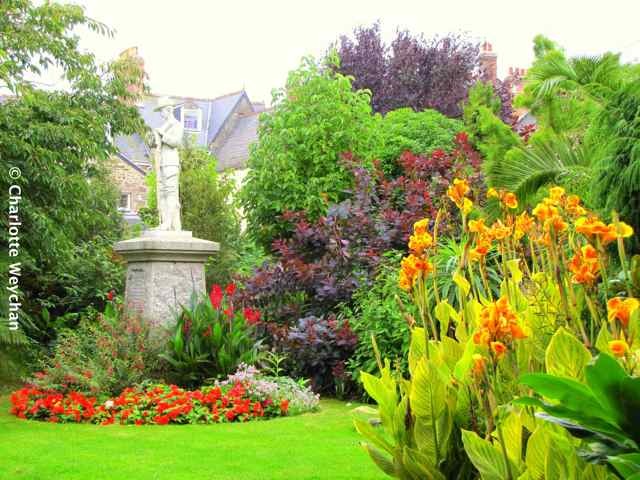 Wander round the town with a camera and you will be amazed by the gardens, particularly the brightly-coloured houses in Regent Square (below), where you will see many unusual plants in bloom. 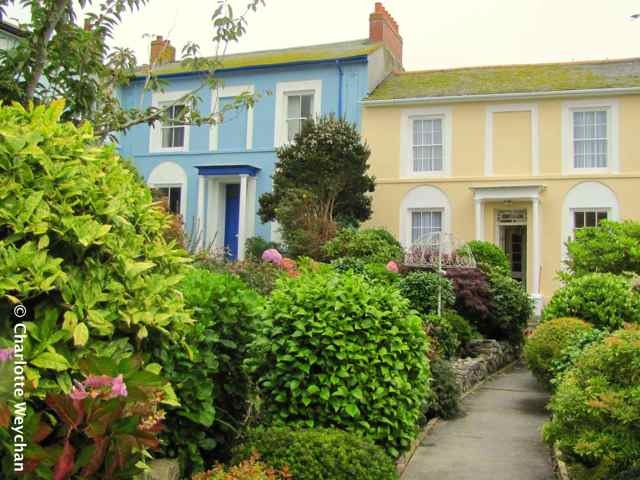 Penzance enjoys an unusual climate, located as it is near the Gulf Stream, and is an ideal place to stay to visit the great gardens locally, including Trengwainton, Trewidden and St Michael's Mount. I'm hoping to get to all three tomorrow, weather permitting, but the forecast isn't looking too good right now, so fingers crossed! 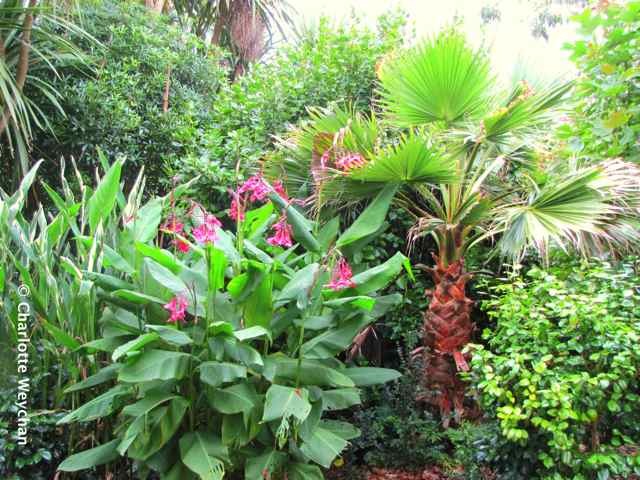 Right in the heart of the town, between the High Street and the seafront, are the wonderful Morrab Gardens (below) - magical gardens laid out in the early1900s where exotic species including palms, trees ferns and cannas thrive in sheltered conditions. The layout has not changed since the gardens were first created more than 100 years ago and there's a wonderful Victorian bandstand, war memorial and fountain ponds - all maintained by the local council and a team of volunteers. 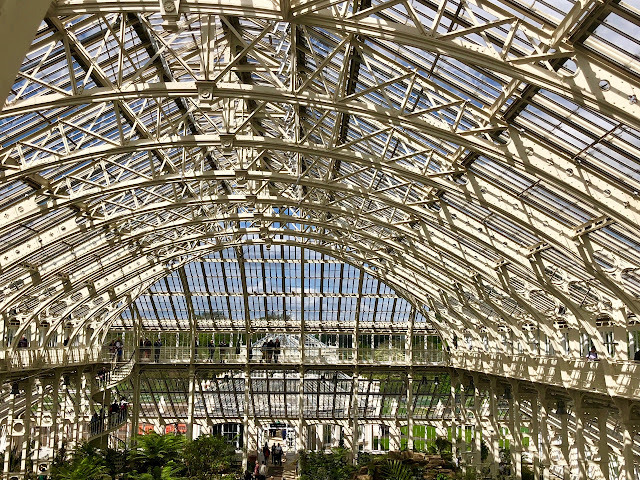 The density of planting (below) is quite striking and the gardens look stunning rain or shine (it was definitely drizzling when I visited!). 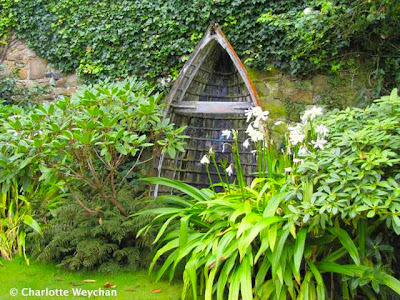 More tomorrow when I know what the weather's like .... but for other Cornish gardens, check out my UK Garden Visits section. Those pictures are beautiful! The subtropical lushness contrasts beautifully with the colorful architecture. The colors are so alive! 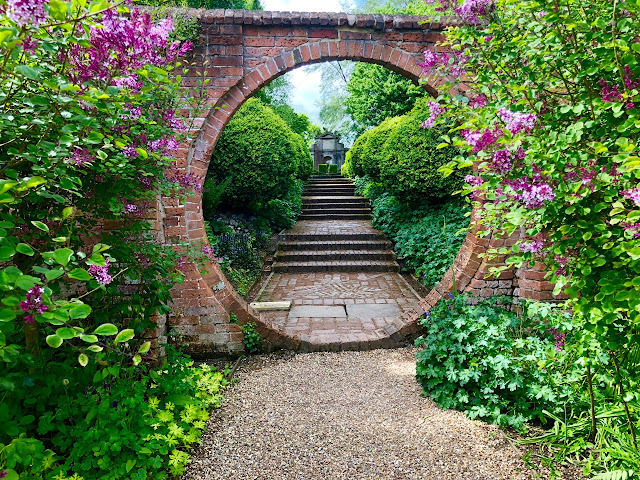 Colourful homes paired with equally stunning gardens, makes one want to visit. I hope you have perfect weather tomorrow. Your header photo is gorgeous as are all your other photos. I just took a look at your Raven Foundation blog - what a wonderful project. Vibrant colors, amazing, as is this lovely travel post. Thank you for sharing. AMAZING Cuban stuff - you living the high life out there?